For the next three months, TU Delft is happy to host Stephen Wong as a guest researcher. Wong is a PhD student in Civil & Environmental Engineering with the Institute of Transportation Studies at the University of California, Berkeley. 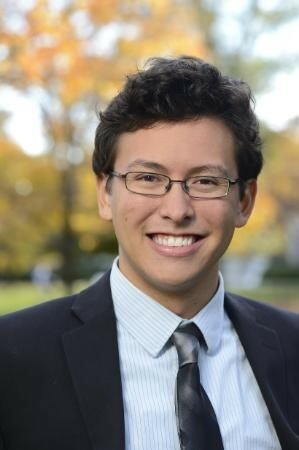 He received a Graduate Research Opportunities Worldwide (GROW) grant from the National Science Foundation (NSF) and its Dutch counterpart NWO, which is an opportunity for United States (US) PhD students from the NSF's Graduate Research Fellowship Program to engage in international research collaboration. Wong’s research interests lie in the field of evacuations, the mass movement of people to safe-guard lives from danger. Evacuations are often used in the case of natural hazards such as hurricanes, wildfires, or flooding. But evacuations extend beyond natural hazards and may also be necessary after terrorist attacks in city centres. The objective of Wong’s research is to model how individuals make choices in risky and high-stake situations and how these models translate into meaningful planning, policy, and strategies for evacuations. He also wants to study what plans, policies, and strategies are currently employed in Europe and determine their feasibility in the US. Vice versa, he also hopes bringing the most useful US lessons towards European practice. Wong will work with Caspar Chorus (professor of choice behavior modeling at the Faculty of Technology, Policy & Management) and Adam Pel (associate professor of transport modelling at the Faculty of Civil Engineering & Geosciences). The Dutch and European knowledge regarding evacuation strategies and threats to the built environment, particularly in regards to flooding, will be instrumental in fostering the exchange of information between the US and Europe. What is special about Wong’s research is that he combines micro-level choice behaviour models – particularly those based in regret theory – with network-level evacuation management models. This unique combination of models across disciplines and across scales is also why Wong choose to come to TU Delft, a place he can team up with Chorus and Pel. Chorus is expert pioneer in regret minimization models and as such, is helping lead the charge to consider models beyond more conventional and rational utility models of choice behaviour. Pel’s expertise lies in the areas of evacuation behaviour and modelling. His work includes traffic simulations for evacuations, traffic loading on networks during evacuations, route choice modelling for traffic assignment, and instructions and information on compliance. Why do we need evacuation models? "It is important to work on understanding and synthesizing evacuation practices to help policy-makers with their transportation management and response when a disaster happens. Standard transportation responses are often times insufficient because they do not consider how people behave during an evacuation. Disaster events are unique, stressful, and very risky. The context is different each time, and each individual or household has to make a series of choices within this context. This complexity must be examined through the perspective of choice models to more accurately describe and predict behaviour, so as to improve evacuation plans. This process can save lives. Unfortunately, in the past, poor government decision-making during Hurricane Katrina in 2005 led to a tragic humanitarian crisis. So we must learn from the past, determine different strategic opportunities, take action, and help policy-makers with making optimal decisions during these extremely difficult evacuations. 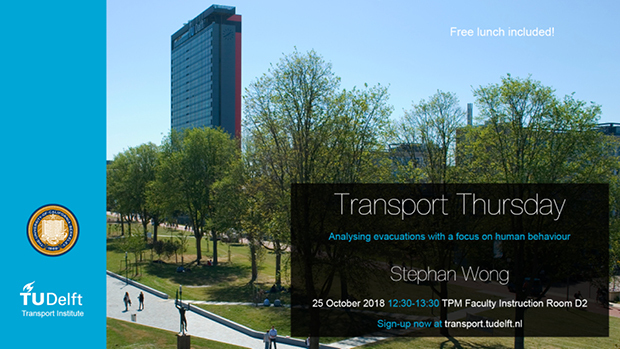 During one of the upcoming TU Delfts’ Transport Thursday events, organised by the Transport Institute, Wong will give a public lecture about his research. The lunch lecture will take place on Thursday October 25th. This free event will take place around lunchtime; lunch is included. Signing up is mandatory. If you can’t wait, feel free to contact Wong via email.